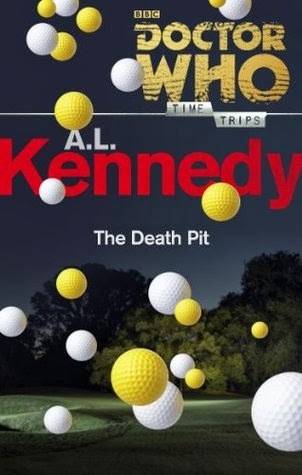 Presenting Time Trips #1 The Death Pit by A.L. Kennedy. Something odd is going on at the Fetch Brothers Golf Spa Hotel. Receptionist Bryony Mailer has noticed a definite tendency towards disappearance amongst the guests. She's tried talking to the manager, she's even tried talking to the owner who lives in one of the best cottages in the grounds, but to no avail. And then a tall, loping remarkably energetic guest (wearing a fetching scarf and floppy hat) appears. TheFourth Doctor thinks he's in Chicago. He knows he's in 1978. And he also knows that if he doesn't do something very clever very soon, matters will get very, very out of hand. Time Trips. The name of the new series from BBC. Novellas containing adventures of the Doctor (almost all the regenerations), in no specific order. This 1st one is a 4th Doctor adventure..... and while I am still scratching the surface with his stories I must say that Kennedy did a perfect job of establishing him through this novella. Although the other prominent characters Bryony & Putta were pretty good enough too but the plot had quite a few chinks in the armor..... On the whole it was quite a good start. "He grinned with rather more teeth than one person should have. He appeared to have been dressed by a committee, possibly a drunk committee: wing collar and something that might once have been a cravat, baggy checked trousers, brown checked waistcoat, long purple velvet frock coat with bulging pockets, raddled shoes... an immense and disreputable scarf with a life of its own..."
I was going to give it a 3 star but the above description of this regeneration was spot on.... so 4 stars couldn't hurt. While the alien entity, the golf bunker, was definitely well put, but it still did not explain its placement there or the erratic behavior of old lady Julia Fetch and the twins.... They felt like they were important but were very much underdeveloped.. There was much of an action-sequence....... Yes there was the battle with the creature but following the level of the classic series in terms of the today's Doctor WHO episodes.... it was quite good. Looking forward to the next one. "A good start to a new DOCTOR WHO series"